Houzz 235 of our visitors have told a friend about this plan. 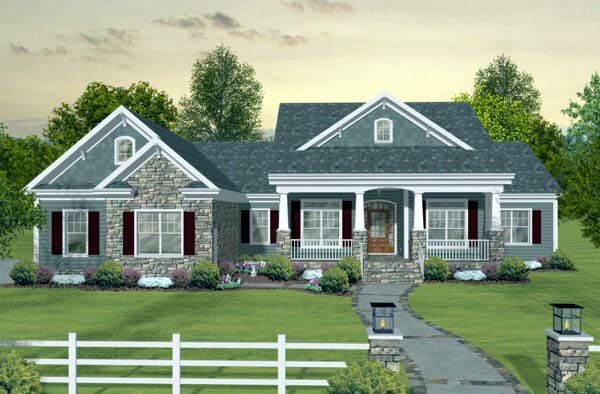 This sophisticated southern country home plan, with its updated Craftsman style facade and spacious interior design, is both flexible and dramatic. 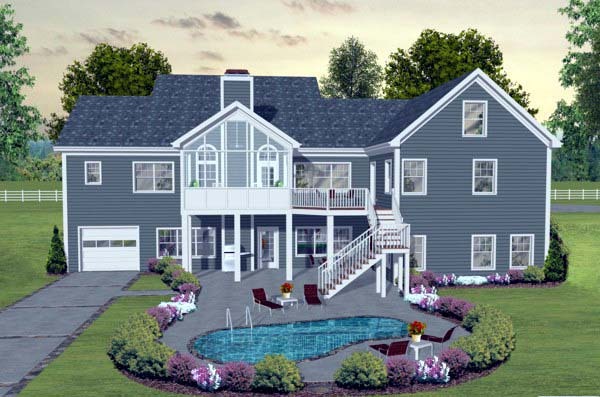 A three car garage, screened porch, spacious country kitchen, an optional 1,535 sq. ft. bonus area and an optional 2,352 sq. ft. basement make this home irresistible! Follow the steps down to the basement where a whole new world awaits! The family recreation area has a game room with plenty of space for a pool table. Also in this space is a full bathroom with access to a mechanical closet. Located right off the rec room is a home theater with a snack area for those movie-time “munchies”! A safe room and large storage closet make the most of this below ground space. The boat garage is accessible through a rec room door. Completing this lower level is an in-law suite with a private bathroom, walk-in closet and a kitchenette. The 1,535 sq. ft. optional bonus room offers space for storage, etc. Question: Hi, is there any interior photos of this particular design? Answer: I regret that there are no further images or photos on this design. Answer: No plumbing, but yes – plans include the electrical schematics. Client should consult mechanical contractor for best location to relocate the mechanical room. Question: how wide are the stairs going up and down ? Question: Do you have this plan shown with brick exterior? Answer: None of the derivatives have solid brick exteriors. Question: The basement shows rooms that are framed up. Can I get a basement that is unfinished? Answer: Yes, an unfinished basement is available. Simply express that you want the unfinished basement option when ordering. Question: I have a few questions. Is there a option without a vault ceiling in the family room or would this request be a modification? Plan 74834 shows multiple bedrooms on second level is there a option available with only one bedroom on second level and the rest open space? Can you confirm if truss be used in roof framing? Answer: Removing the vault in the family room and expanding the bonus level would be a custom modification. I regret that we do not have a version with only one bedroom on the bonus level. That can easily be done in the field with the builder. Lastly, the roof system is framed using rafters. Question: Does the bonus area have a loft option to over look the main living area? Answer: Only above the “F” in Future noted on the upper floor plans. And even that will only have an opening about 42” in height. Question: Can we replace doors with pocket doors? Can this home be built on a hill with full unfinished basement so we can have the main level on one floor and the basement on the back side on the hill side? Answer: Assuming you are needing the rear of the house exposed being on the hill side (or sloped side), the plan already comes as a rear walkout. The design also comes standard as an unfinished basement. The finished basement option is optional. Simply request the unfinished basement version when ordering. As for the pocket doors, pocket doors require about 2/8 to 3/0 of room beyond the door in the wall for the pocket frame. Subsequently, any door that has that amount of space in the wall beyond the door opening, it can be changed to a pocket door. Question: Do you have a virtual tour available for this plan? Answer: I regret that there is no virtual tour for this design. Question: What is the size of the shower and bath tub in the master bathroom. Can the shower be made doorless? Answer: Windows are 2-8x5-2 across the front. Question: Would this plan work on a corner lot? Click Here to download a free PDF Brouchure of Plan Number 93483.